I promise you, we will end up today very close to the love song of the last episode, though we will travel a ways before we get there. I’ve not featured any French writers yet with the Parlando Project, but as this summer has used the words of many 20th Century English poets, we may be overdue for that, as the start of that century found some of them looking to the French for some new ways to write. French poets started to go “modern” before the British poets, around the same time that Emily Dickinson and Walt Whitman were making their own breaks with past practice in America, so they had a head start, and their avant-garde was way past the supply lines of conventional narrative and sentiment by the time the 20th Century really got rolling. The absurd casualties of WWI, largely fought in France and its neighboring countries, and so deadly to some of the generation of men doomed to fight in it, only accelerated the modernist direction away from the kind of meaning you might find in a political speech or battle plans. The Surrealists went on from there, going in various directions, becoming less an idea and more of a brand—but stop and think for a moment, that original idea, isn’t it powerful? The idea that there is a reality that we agree not to apprehend, not to speak of, that we constantly reframe our thoughts to, isn’t that idea political as well as aesthetic? You take the idea of Surrealism, add music to it, and later that century you get Bob Dylan. You take the idea of Surrealism, apply it to the current reality, and you are woke, not from the dream, but to the dream that should not be denied. Today’s piece uses the words of one of the French Surrealists, Paul Éluard. Éluard, like many of the British poets of this era, was another veteran of WWI. One story of his war service was that, since he was a writer, his military superiors assigned him to the office tasked with writing the official letters to the relatives of the casualties, and such was the efficiency of modern war that he sometimes needed to write 150 of them a day. After a year of this, he asked to be sent to the frontline trenches. 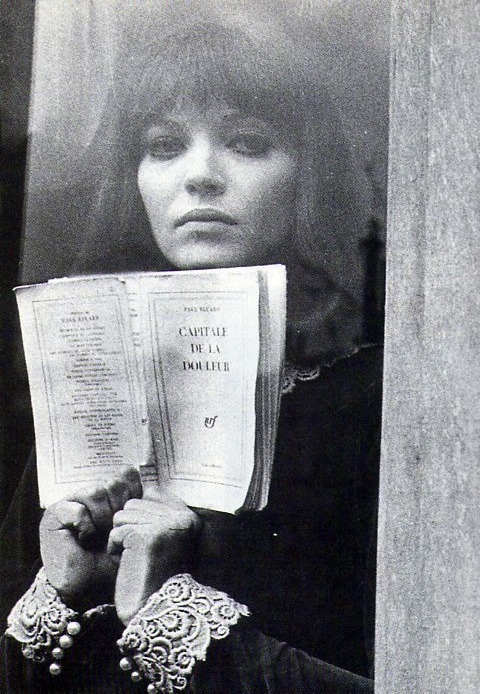 Jean-Luc Godard’s film “Alphaville.” “I love you” could be the ending. I have exposed you several times this month to pieces about the horrors of war and slavery, but I also told you we must travel a ways to get to today’s piece. After the war, as a founding Surrealist, Éluard produced verse with strange images and seemingly arbitrary combinations—Surrealist tactics to break the conventions—but his great subject, against the night, pain, and suffering, was love. Perhaps after those 150-letters-a-day forced march, he too wanted to look to war’s opposite. 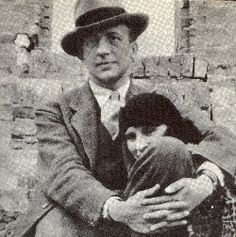 Paul Éluard and the beloved, Gala. Eyelids not visible in this picture. “L’Amoureuse” (The Beloved) is one of Éluard’s most famous early works, and uses my English translation of his words. The LYL Band performance of it was recorded live several years ago. To hear it, use the player below. Thanks for looking. You’ll find that I’ve been I’ve been posting quite a few things about the early 20th Century modernists and their antecedents here. I’m more at the literary and musical side, but the visual side of your site has some great stuff. There’s no crime in not liking Dylan, plenty of folks, some smarter than me, don’t care for him personally or artistically (grin). My cause here regarding Dylan is to remind folks that he revolutionized what was possible in song lyrics, by bringing the tactics of the Surrealists into song lyrics, and because song lyrics are the way that most people experience poetry for the last 50 years or so, he carried forward the literary part of the Surrealist movement substantially.